Turkey’s post-coup witch hunt continues targeting small and large business owners and main indicators prove that cruel purge is bad for the economy as a whole. The unemployment rate, according to most recent data, jumped to 11.3 percent in September standing at a six-year high. 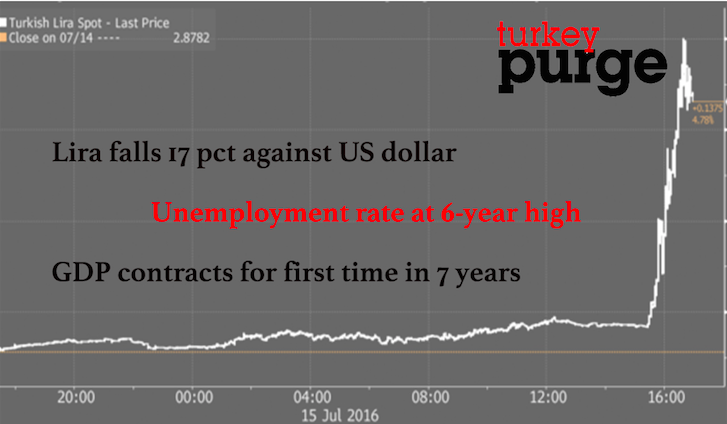 Meanwhile, the Turkish lira lost 17 percent of its value against the US dollar since the putsch attempt. Lira’s fall also brought about 24 percent drop in dollar terms in Borsa Istanbul 100 index over the same period. The drop marked the biggest loss in equity markets after Egypt and Mongolia. The state-run Savings Deposit Insurance Fund earlier said 691 companies were seized in post-coup dragnet and their estimated value stands at about $10 billion. Last but not the least, Turkish economy contracted for the first time in seven years in the third quarter of this year, by 1.8 percent, comparing to the same period a year ago. In an article dated Dec. 14, Bloomberg presented a snapshot of the economic impacts of the Purge while interviewing businesses in micro level. Below is the full text of the article. “The lights are off and the machinery is silent, most of the workers sent home for what may be forever. It only took two months for the government of Turkey to run this peanut plant into the ground. Not long ago, the Baspinar family factory in the fertile region near Syria was being hailed on state television as a model of Turkish entrepreneurship. Enes Baspinar, the company’s celebrated 41-year-old former general director, had been one of the country’s largest suppliers of roasted peanuts and was about to enter the German market for peanut oil, freshly printed labels ready to go. But then rogue elements in the army tried to oust President Recep Tayyip Erdogan, sparking a nationwide dragnet for suspected sympathizers of the reclusive cleric blamed for the July coup attempt, Fethullah Gulen. In October, after pushing through anti-terrorism laws, the government took over Baspinar’s company. Now he and his co-owners, his father and two brothers, are among more than 100,000 Turks who’ve either been jailed, fired or had their assets seized in the hunt for enemies of the state. “The takeover is designed to ruin the business,” Baspinar said in Osmaniye during a tour of the darkened factory, where he’s still allowed to keep a desk. It’s a pattern being repeated across Turkey as Erdogan and his allies rush to dismember what they’ve called a vast conspiracy hell-bent on seizing power. The climate of fear created by the bloody putsch and subsequent crackdown has soured investor sentiment, sapped consumer demand and disrupted supply chains. On Monday, the government released its widest measure of the economic damage sustained so far, gross domestic product, which contracted for the first time in seven years in the third quarter, by 1.8 percent. Officials insist that purging Gulenists will benefit the economy over time, saying the control they once had over key institutions, from the courts and police to unions and universities, constituted a “parallel state” that corrupted the bureaucracy and undermined the rule of law. Erdogan, whose approval rating jumped to a record 68 percent in August, has responded by pressuring the central bank and commercial lenders to cut rates and boost loans, appealing to their sense of patriotism. He’s also urging all Turks to convert their dollars into liras to arrest the currency’s historic fall. “We need to stand up for our economy like we stood up for our future on July 15,” Erdogan said Dec. 3. He was referring to the date of the attempted takeover, which he claims Gulen, a former ally, orchestrated from the U.S. The preacher, who’s been holed up in a compound in rural Pennsylvania since 1999, was instrumental in the president’s political rise, providing much of the organizational expertise his AK Party needed to govern after it swept to power in 2002. But that relationship ended in a hurry in December 2013, after alleged Gulenist prosecutors started probing Erdogan’s inner circle for corruption. Sensing the impending confrontation, Baspinar said he quickly took sides. He quit his local trade group, Ogiad, which had been set up by Gulenists, and declared his support for Erdogan. It’s outrageous, he said, that three years later his company is among almost 700 seized simply because he was a member of Ogiad, which was backed by the state and provided export contacts and financial advice that helped him succeed. Deputy premier Nurettin Canikli said in the capital Ankara last month that the leadership wants all confiscated enterprises to function smoothly until the judiciary can rule on their ties to Gulen. If a seizure is endorsed by the courts, the Savings Deposit Insurance Fund will prepare the underlying assets for sale. An official at the fund estimates the collective value of all the companies arrested to date, including four that are publicly traded, at about $10 billion. The fund, known as TMSF, declined to comment on individual companies. A wave of terrorist attacks by Kurdish separatists, most recently dual bombings in Istanbul that claimed 44 lives, has heightened public tensions amid a political upheaval that’s reached every corner of society. More than 100 media outlets have been shuttered and more than 36,000 suspected Gulenists detained, including scores of officers, judges, executives and academics. Badem, 46, is one of legions of terminated workers who’ve yet to be counted in the official statistics. The jobless rate spiked after the purges started and stood at 11.3 percent in September, a six-year high. The impact on the currency and stock markets has been just as dramatic. The lira has tumbled 17 percent since the putsch, the largest depreciation among major currencies worldwide, data compiled by Bloomberg show. The Borsa Istanbul 100 index is down 24 percent in dollar terms over the same period, the biggest loss in equity markets after Egypt and Mongolia. Sevket Pamuk, an economist at Bogazici University in Istanbul, said the malaise will almost surely deepen despite government plans to continue cranking up spending, which jumped 24 percent last quarter. Baspinar’s troubles offer a snapshot of how the clampdown is rippling through communities large and small, ravaging livelihoods. His company, once a source of local pride, is now a pariah. Customers have stopped buying. Alarmed lenders have halted credit lines and frozen accounts. Even after the four appointed external managers laid off three-fourths of the 130-strong workforce, there’s still not enough cash for operations. The mothballing of the region’s largest peanut buyer has been a disaster for an estimated 10,000 local farmers. Prices have plunged from more than 4 liras ($1.15) a kilogram to as little as 2, halving incomes. And the financial pain is even more acute for major growers like Taskin Atmis, who said he’ll consider himself lucky if he can just get what he’s owed for past deliveries. Now the peanut purveyor is in legal limbo, waiting for Erdogan’s prosecutors to produce an indictment so he can defend himself in court and try to get his life’s work back — whatever’s left of it. But with Turkey still under a state of emergency that allows for rule by decree, he said the prospects for justice seem more fleeting by the day. And he’s not the only one with doubts about the post-purge court system. Last week, the ENJC, a body that promotes judicial independence in EU member states, suspended Turkey’s observer status for failing to meet its standards. Outside the factory, Baspinar sighed as he reflected on the millions of dollars’ worth of new equipment just sitting there, doing nothing. He said he was still trying to wrap his head around the irony of being punished by the government for being in a trade association when it was backed by that same government.